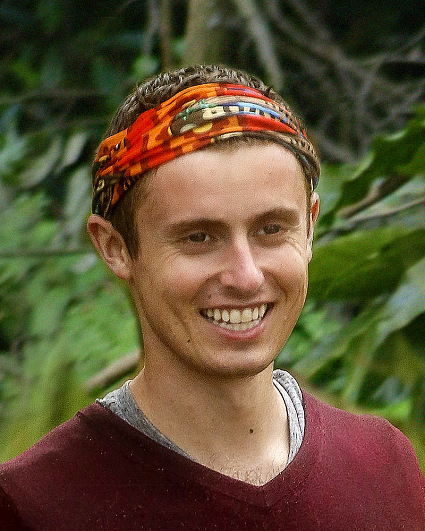 Hobbies: Board games, poker, browsing the Survivor Subreddit, and travel. Pet peeves: Bullies, long lines, and smokers. As a volunteer, I chaired a Relay For Life event that raised over $135,000 for cancer research and grew in size from about 10 youth participants to over 500. If any of that money helps save my mom's life, then it is, by far, my most important accomplishment. My mom. She is surviving lung cancer and has survivorship in her blood [because] her mom survived Auschwitz. She is incredibly physically fit and otherwise healthy. She can tear up the dance floor—that's where I get my moves!—and she's my best friend and supporter. A picture of my family to keep myself grounded and focused, a fake hidden Immunity Idol because the threat can be just as powerful as the real thing, and a razor because I hate mustaches with a fiery passion. Spencer Bledsoe (Cagayan, Cambodia). We are both wise beyond our years, can easily play up to the egos of older and stronger players, are strategic thinkers, and are widely underestimated in the game. I also relate to the never-say-die nature and social finesse of Hayden Moss (Blood vs. Water). When I set a goal in life, I achieve it. As an ultimate super-duper fan, winning Survivor is an unrealized goal that I simply must accomplish. I have dreamed of winning Survivor since I was 9 years old, even going so far as to play Survivor online when I was in middle school. The money is secondary, but not unimportant because it would allow me to continue my passion for social justice. Why do you think you’ll "survive" Survivor? No one is going to fight as hard as I will for that title. I may be—and look—young, I may be small, but my fellow competitors won't know what kind of power punch I pack until they are already knocked out. I will use my youthful charm and energy, combined with my strategic nature to win. I come from a long line of real-life survivors, and I am next.